So here we are, about to begin another year! Time really does fly when you are having fun! Hopefully, this past year has been good to all of you. 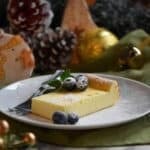 It is always nice to end a holiday meal with a refreshing ricotta cheese dessert. I mean, there will definitely be no shortage of cookies: I have made and glazed my Mostaccioli di Mamma cookies; my Pizzelle are all neatly stacked; I could never forget my Soft Amaretti Cookies; and my family will revolt without these Chocolate Snow Caps! But, despite all that, there is nothing like desserts with ricotta cheese to end a meal, right? 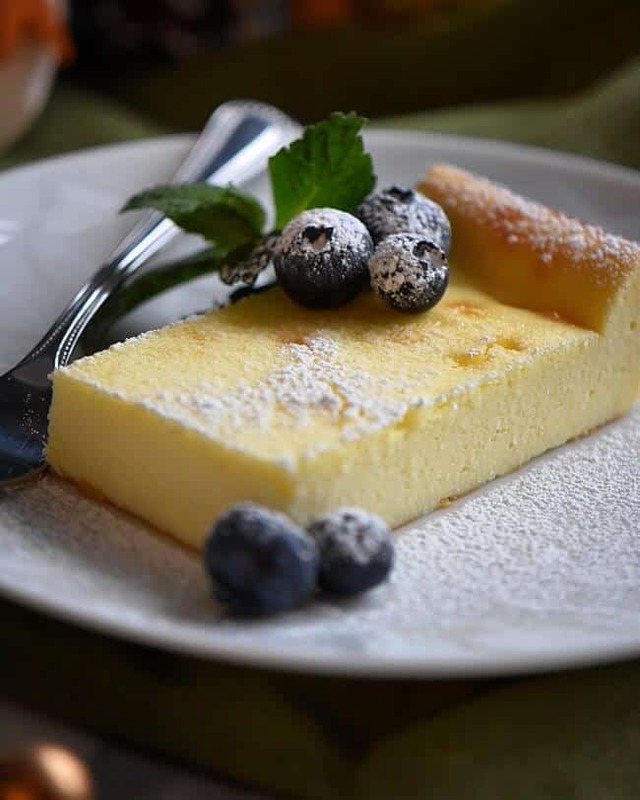 Today, I would like to share with you this Lemon Ricotta Cake Recipe. If you recall, I made some Creamy Limoncello a few months ago. I still have a bottle in the freezer that I will use exclusively for desserts. 1- Quick to make: This limoncello dessert recipe takes about ten minutes to assemble. That’s it! Since it only has five ingredients, it really is only a matter of whipping all of the ingredients — ricotta cheese, eggs, sugar, lemon zest and limoncello — together in your stand mixer. and then pouring the resulting batter into your pan. Bake it, and you’re done! How fast and easy does that sound? 2- Make it in advance: This ricotta cheese dessert recipe can be made the day before the big event. Talk about convenience! On the day that you want to serve it, just sprinkle with icing sugar and add your fresh fruits. Blueberries, strawberries, raspberries are all wonderful with this cake. Naturally, making this limoncello cake in the summer will give you more fruit options to enjoy it with. But I also love it with apple or pear compote in the fall, and with pomegranate seeds in the winter. The pomegranate seeds in particular give this cake such a glossy, twinkly finish which suits the magic of the holiday season perfectly! 4-Ricotta! Who doesn’t like ricotta desserts? They are so light and refreshing! Ricotta cakes are extremely appreciated, especially after a big meal. In my books, you can never go wrong with ricotta! Over a decade ago, I picked up a cook book entitled The Italian Way in a second-hand book store. The simplicity and convenience of this ricotta dessert recipe immediately caught my eye, and I just had to try it out. It’s been a hit with my family ever since I first introduced it! What I especially love about desserts with limoncello is the refined and elegant taste. Imagine ricotta combined with the lightness of lemon and limoncello… It’s not too sweet and not too dense, but it still feels like a treat to eat. I would like to take a moment to thank all of you for your continued support of She Loves Biscotti. I am extremely grateful to all of you. Wishing all of you and your dear ones many blessings of health and happiness for 2019! If you have made this wonderful Italian dessert, I would love to hear about it in the comments below and be sure to rate the recipe! This Creamy Limoncello Italian Ricotta Cake Recipe is a light and refreshing gluten free dessert with just the right amount of sweetness. So simple and convenient to prepare. Preheat the oven to 350℉ (175°C) . Grease or use non-stick spray to coat an 8 x 8 square baking pan. Set aside. In a mixing bowl of stand mixer, whip the ricotta until creamy. Add the eggs, one at a time. Make sure to scrape down the sides of the bowl. Add the sugar, one tablespoon at a time. Scrape down the sides of the bowl. Add the lemon zest and the liqueur. Beat until smooth. Pour batter into greased 8 x 8 pan. Bake in preheated oven for 30-35 minutes until light golden, firm and set. Allow to cool before serving or can be refrigerated and served the next day. If desired, garnish with small berries, mint leaves and drizzle with extra limoncello. Both the creamy and the not creamy (ie clear) Limoncello work well with this recipe. DO YOU LOVE THIS RICOTTA CAKE RECIPE? Could you convert the cup weight to grams please. Hi Elizabeth, 2 cups of ricotta is approximately 460grams. Hope you get a chance to try it. Thanks for stopping by. Looks great and sounds delish. Can this recipe be doubled without a problem? My rendition taste wonderful but not as pretty as yours. Mine blistered a little. How did you get that nice ridge/crust on edge of yours? I used 8×8. I discovered your website a few weeks ago and it has warmed my heart to see so many recipes that my mama used to make. Grazie! Happy new year. I have a lot of homemade limoncello and never know what to do with all of it, other than drink it straight. This delicious cake looks like the perfect solution. Thank you so much Albert! It is a definitively a favorite for us! Thanks so much for stopping by 🙂 By the way, you have a great YouTube channel! Continued success and all the best to you in 2018! I make limoncello, but not the creamy style, still I would like to use it. Do you have any ideas for modifying the recipe to accommodate the not creamy style limoncello? Saw this recipe and it looks delicious. What is lime cello? Where in the store will I find it? Best wishes to you and yours for 2018! Straightforward, simple and delicious – thank you Maria! Buon Anno to you and your family and I look forward to another year of friendship . Looks delicious! The 4 eggs are large ones? Thanks. Happy New Year. This sounds wonderful, and perfect timing – something slightly less sweet after all that holiday indulgence! Happy Holidays! Thanks Riz! Also wishing you the best of this holiday season! OMG I literally GASPED when I saw this. I’ve made something similar in the past, but this has a little more to it, and I will definitely be making it in the near future. 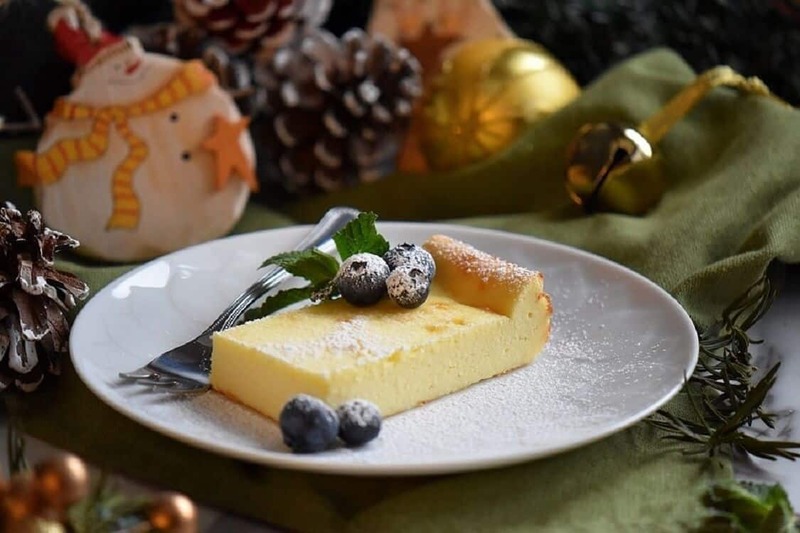 I am so glad that I came across your recipe for Creamy Limoncello Italian Ricotta Cake, Maria. I was planning a gluten free menu for New Year’s dinner and your recipe is exactly what I was looking for. Thank you so much for sharing. All the best to you in 2018! 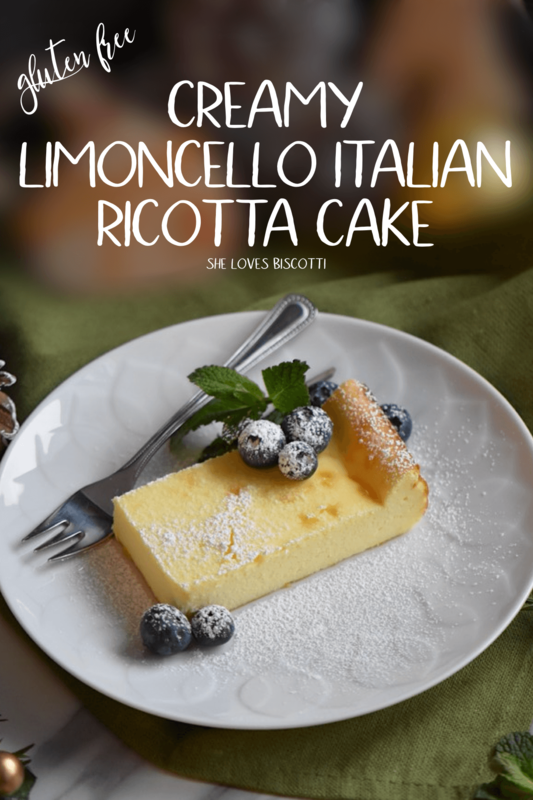 I love desserts that have ricotta and lemon in them! This one looks pretty easy to make too, thanks for sharing! It’s the whipped ricotta again!!! Thanks Diane ♥ All the best to you and yours!